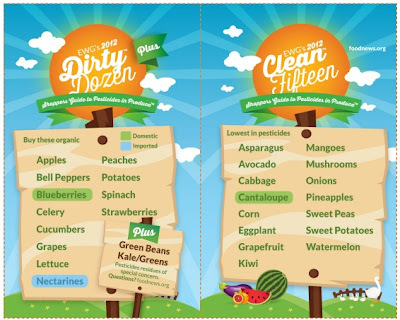 Did you know that the produce at your grocery stores could be covered with bug killers, fungicides and other chemicals? In fact, the most recent round of U. S. Department of Agriculture and Food and Drug Administration tests have found detectible pesticide residues on 68 percent of food samples. That gross little fact is why The Environmental Working Group is committed to giving you the tools you need to buy safe and healthy produce. Take note of their Shoppers Guide to Pesticides, Dirty Dozen and the Clean 15 List. It could be a life saver, literally. This Rocking salad was my own creation today and it's so good I have to share it with the world. & a very light drizzle of raspberry vinaigrette dressing! Mix all salad ingredients together and then drizzle the dressing! Enjoy! This amazing application (also a website that I linked to above) could revolutionize the way you think about eating and grocery shopping. While you are standing in the aisles comparing prices and ingredient lists, remember to whip out your phone and scan the barcode to see the food's grade (or health rating). It's a lot easier then trying to read the nutrition labels yourself and actually provides you with more information AND healthier options! I love using the app when I'm looking at the snack aisle, it's funny how many of these products claim they are healthy when they are obviously highly processed and not good for you at all... I dare you to fire the app up next time you are standing near the "healthy" options like the 100 calorie packs or the Slim Fast Meal bars. That is so crazy to think we have things like this going on and I see people letting their kids eat grapes out of the produce dept while they shop. Yuck! I am going to try this app in my grocery store snack isle the next time I go. Thank you for all the information! That salad looks so good. 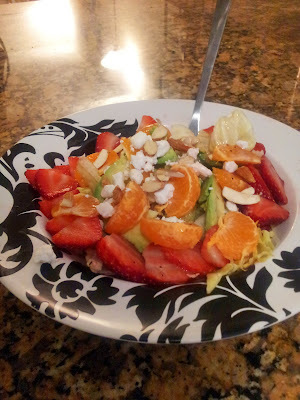 I need to get more creative with my salads. I always make spinach leaf, tomatoes, cucumbers, shredded cheese and dressing. So boring. I had no idea the fruits and veggies had so many pesticides, etc. on them! Ugh! I believe it about the fruit. I picked up a parasite for m some fruit I bought out of the store, even after I had washed it with a vegetable scrubber. I was sick with severe intestinal problems and vomiting for a week and a half. I will never trust eating peelings again!